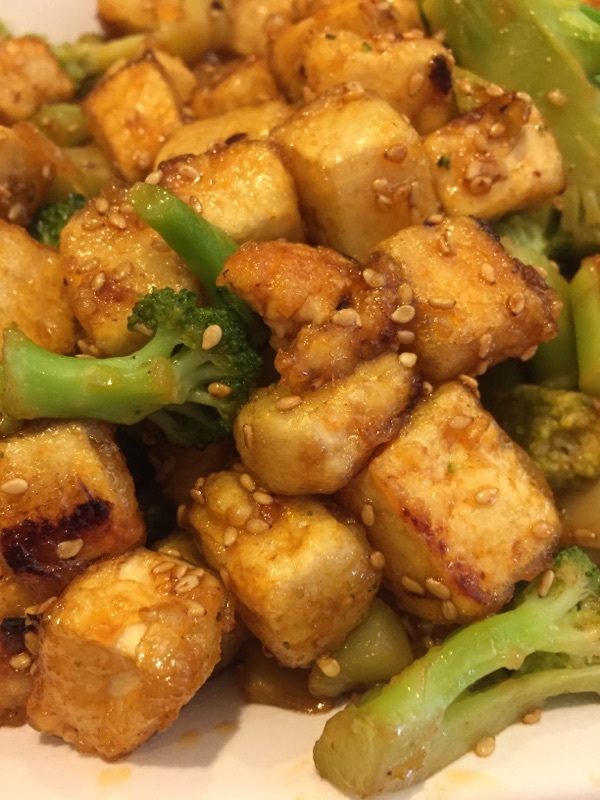 Honey Sriracha Tofu Stirfry – Mama, Can I Lick the Spoon? I grew up in a family of hunters. My daddy, brother, and even my mom hunted deer. Daddy and Stacey also hunted squirrels, wild turkey, hogs – you name it. If it lived in the woods and was legal to hunt, they hunted it. Needless to say, we also ate meat. My family are not trophy hunters. If they kill it, it’s eaten. When I was growing up, the majority of our food came from the woods and the garden. So you can imagine my surprise when Elizabeth mentioned yesterday that she wants to be a vegetarian. She’s never really liked meat that much. Aside from chicken nuggets and hamburgers, she really doesn’t like meat. When she announced her decision yesterday, I didn’t go nuts or tell her she was crazy. I listened to her talk about what she thought she should eat. And then I asked, “What about eggs?” because she loves eggs. “And what about cheese and yogurt?” Two of her favorite things. She looked sad that her master plan wasn’t going to work out and then I said, “You know some vegetarians still eat dairy and eggs.” So, for now, she is a lacto-ovo vegetarian. I say “for now” because she’s twelve and may not stick with this decision for long. But while she is, I will do my best to help. I went to the store yesterday and bought a couple of things. 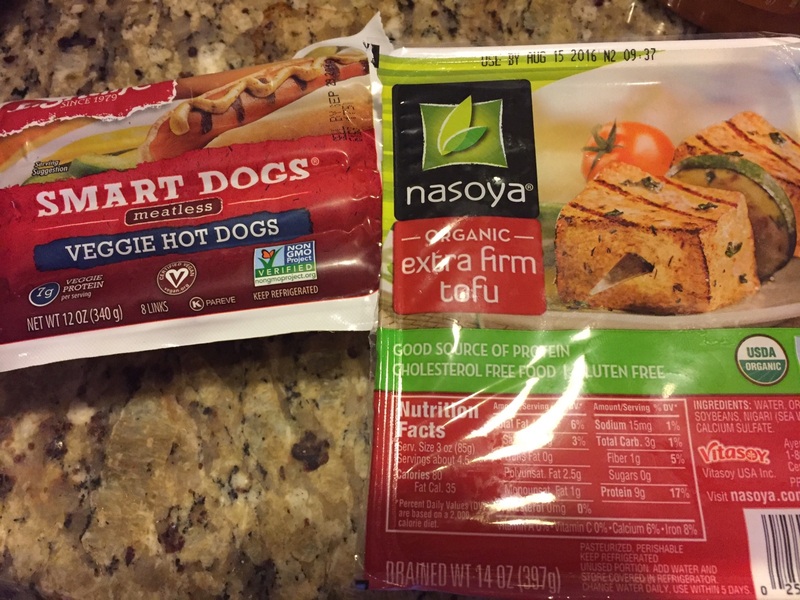 Anyone that has Whitman blood in them cannot live without MEAT. You know this!!! We are carnivores. Where can you hunt tofu? And are they hard to skin? Remove tofu from wrapper and wrap in a paper towel. When towel is wet, remove and replace with another paper towel. Do this 2-3 times, pressing the towel to the tofu each time to help remove excess moisture. Once you remove the towels, cut the tofu into 1-inch pieces. Place cornstarch into a large zippered bag. Add the tofu cubes, seal the bag, and shake until every piece is coated. Pour the cubes into a strainer and tap to remove any excess cornstarch. In a small bowl, combine the sriracha, honey, soy sauce, vinegar, and sesame oil. Set aside. In a large skillet, drizzle the olive oil and add the garlic. Cook for about 1 minute on high heat, being careful not to burn the garlic. Add the tofu cubes. Cook them for about 10 minutes, turning/stirring them every so often to cook each side. 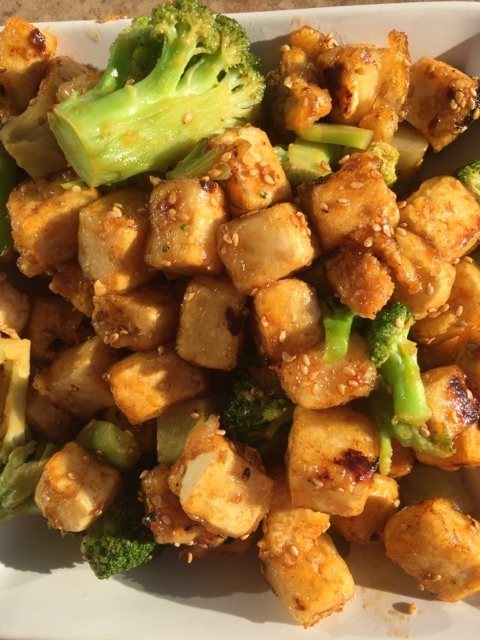 When the cubes are light golden in color, add the sriracha mixture and stir to coat each piece of tofu. Add the sesame seeds and cook for 2-3 minutes. Sauce will coat the tofu and pretty much disappear. Add the warm, cooked broccoli. Serve either by itself or over white rice. Well Duh #1: You could add any cooked vegetable that you like, just be sure to warm it first so that you really only have to stir it into the tofu cubes to combine them. Well Duh #2: Add more sriracha if you like. I only used 1 tablespoon and it was plenty hot. Be careful about adding more. Taste the sauce as you add a little at a time. You can always add more, but if you add too much, there’s really no going back. Well Duh #3: I have a serious addiction to sesame oil. The smell, the flavor. Everything. I put at least 2 tablespoons in my mixture. Well Duh #4: Don’t overcook the tofu. The darker color you see in my pictures is from the sauce. The tofu was a really light, beige-ish color before I added the sauce. It was so good! I seriously had to ask Elizabeth to take the plate away from me. I kept sneaking pieces! Even Michael liked the taste I gave him – although he said he would like the tofu cut into even smaller pieces so that there was more of a crispy factor. Christopher refused to try it. Mostly because he popped a little piece of it BEFORE I coated and cooked it and was completely grossed out by the taste and texture of completely unadorned and unflavored tofu. I tried to warn him! This made a lot and tofu is very filling. Elizabeth loved it and has already asked when I can make it again! Not sure if you remember, but I became a vegetarian the summer after 9th grade. I was 15. In our family, that was also unheard of. Twenty-two years later, I am still vegetarian. I, too, am lacto-ovo. I love milk, cheese and eggs. I don’t think I will ever be vegan. I have a ton of recipes that are easy to make if you would like them. Good for Elizabeth going against the norm! Annette – I would love any guidance you can give!